The romantic phrase "I love you" is said around the world in every language. These sweet words are spoken to profess emotions of fondness, desire, affection and admiration for another person. We'll show you how to say "I love you" in 20 languages. You'll never know when you might want to say those words in a different language. To make the phrase something special or unique to you and your loved one, speaking or writing it in another language is a warm and touching gesture. Saying "I love you" in another language can be a sweet way to show your affection. Learn this simple phrase in a language other than the one you typically use to show your loved one that they are special to you. This gesture is sure to impress and grab their attention. Note that those with non-Roman alphabet are written phonetically in English. In addition to saying "I love you" in words, you can also sign the words in American Sign Language. This method is the universal way to say "I love you," no matter what language you speak. To do this: Spread out your hand and bend down the middle finger and the ring finger, leaving the others up and out. You can do this gesture from across a room to let your significant other know you love them or simply do it whenever the mood strikes and you want to be silent in your declaration of love. If you are looking for a way to impress someone special, consider saying "I love you" in a language other than your native one. If your loved one speaks another language it would also be a touching way to show how much you care about them. This phrase does not need to be reserved just for an occasion such as Valentine's Day; you can use it whenever you want to express your true feelings. Consider writing "I love you" in a different language in a love letter or card. You can also text this phrase to your beloved or use it to end an email to your sweetheart. You may also like to include a sweet love quote. If you are hesitant to say these words to someone, using another language may make it easier for you to say them for the first time to your love. You can sweetly say this phrase as an attention grabber and let them know that you love them and want them to know how special they are. Our Spanish words of love or love poems and quotes articles will show you more ways to express your love in this beautiful language. When you're ready, learn how to say thank you in many languages too. "How to Say I Love You in 20 Languages." YourDictionary, n.d. Web. 17 April 2019. <https://reference.yourdictionary.com/reference/other-languages/how-to-say-i-love-you-in-many-languages.html>. 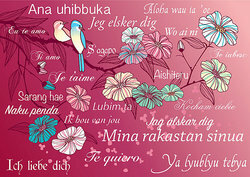 The romantic phrase "I love you" is said around the world in every language. These sweet words are spoken to profess emotions of fondness, desire, affection and admiration for another person. We'll show you how to say "I love you" in 20 languages. You'll never know when you might want to say those words in a different language. To make the phrase something special or unique to you and your loved one, speaking or writing it in another language is a warm and touching gesture.